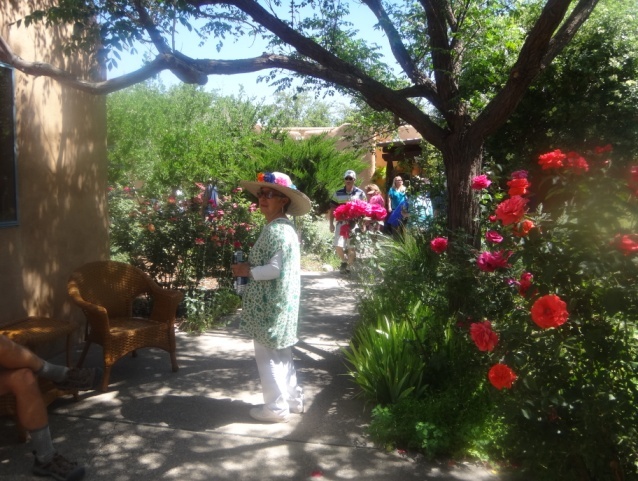 Our garden was invited to participate in this year’s Corrales Garden Tour. Because neither of us had ever been on the tour, I had no idea what sort of gardens it featured, but I imagined them to be manicured affairs, with disciplined beds and hedges and mowed lawns. Ours, on the other hand, is a form of chaos. We cut the grass only in winter so overwintering Sandhill Cranes can find the corn we lay out. Things are planted wherever David thinks it would be nice to see them -- a weeping cedar over there, or a peach tree over here, a claret cup cactus by that boulder, a redbud where there used to be an apple tree, a vitex behind a sitting rock. If something takes root on its own and produces a flower, it doesn’t really matter where it is, David will protect it with his life, even if it means tripping over it on the way to the front door. Hollyhocks and sunflowers, penstemon, columbine, primrose and poppies come up wherever they please. Flowers have the right-of-way here. There was a certain amount of design when we bought the house . . . southwestern grasses and a dry creek, but grasses have been replaced with roses and the dry creek bed flows with a river of tiny composites. A part of the land had been left by the builder as an empty lot. For a year I looked at it whenever I did dishes; sandy, weedy, abandoned. I actually like abandoned spaces, places where whatever comes along takes over, places where sand and space are dominant, but this one was walled in. Walling in weeds is antithetical. What we call weeds are just plants finding their own environment (providing they aren’t exotics), but it can’t be a partially controlled environment. They need to be free of walls. They need the entire southwestern desert. A wall defining a weedy empty lot makes a piece of land look like a slum. Not that I have anything against slums. I’ve lived in a few. A seven story walk-up . . . good for conditioning. Sitting on the stoop to get some air . . . good for meeting the neighbors. 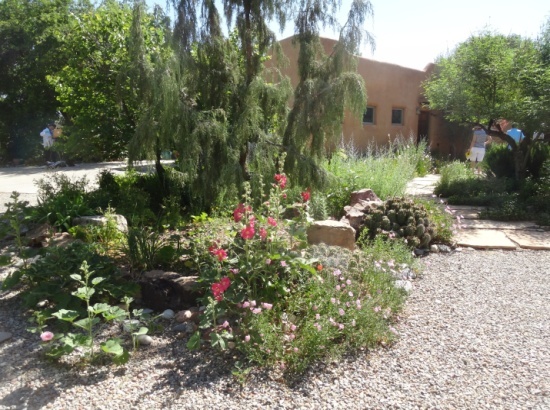 We hired NM landscape designer Judith Phillips to plan a garden for the area that is the view from the kitchen sink. She mapped out pathways, and the placement of major sandstone rocks, the softness of the meadow in the center, the little Zen garden. But the plants she envisioned have transitioned into other plants. Even if David hadn’t replaced some ideas with other ideas, Time would have made changes. 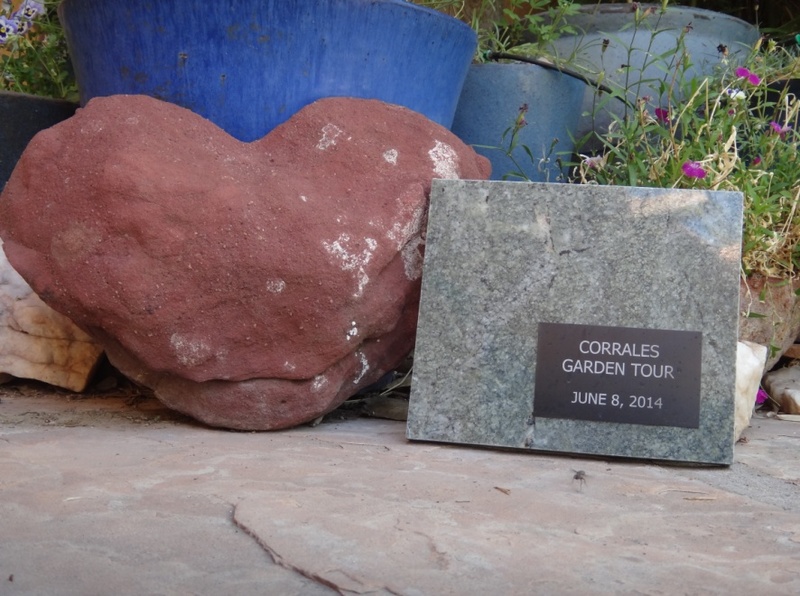 The land outside this “new garden” is a remnant of the historic Corrales orchards. As old apple trees die, David replaces them with newer fruit trees . . cherries, peaches, apricots. But some of the old trees spread magnificent branches in their insistence that what is old is also beautiful. 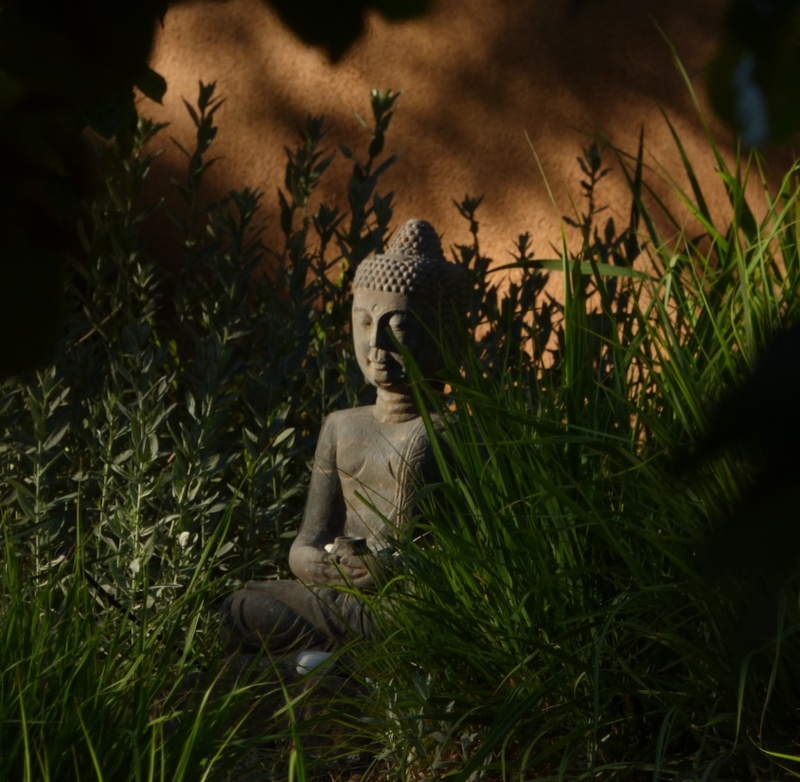 There are ponderosas in the new garden, and cedars, junipers and redbud. 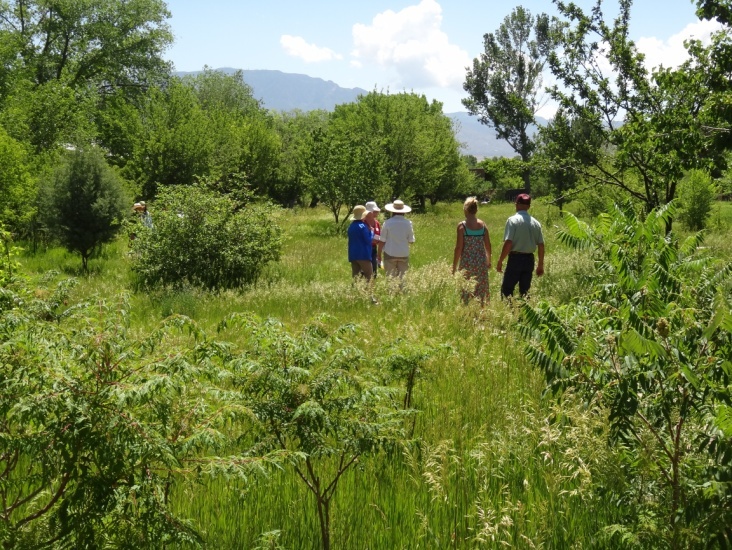 In the tall grasses of the field David refers to as the east orchard there are white pines, Arizona cypress and an alligator juniper along with the fruit trees. We were married in the east orchard, shaded by two rows of apple trees. A flagstone path makes its way from the house through the orchard to a bench at the back, where there are more roses. In the days before the Garden Tour I noticed roses that were supposed to twine up a trellis leaning toward the bench instead. During the event I came upon a woman sitting on the bench. One tendril had wrapped itself around the woman’s long blond hair so it seemed as if she’d adorned herself with roses. Perhaps she had been sitting there for days, entwined, enchanted. Perhaps she was a garden sprite I simply hadn’t noticed. Flowers along the flagstone entrance path to the house have been allowed to remain in the places they choose. So, walking toward the house, you have to thread your way between penstemon, primrose, poppies, a flamingo-colored yucca, overgrown lavender. The nursery beneath one of the biggest of the old apple trees on the north side of the house is filled with cactus in pots because they could not survive the New Mexico winter in the ground. Other exotics (in pots), from places like Africa and Peru, also come inside in winter. Bamboo grows along the whole north side of the house, and in front as well. 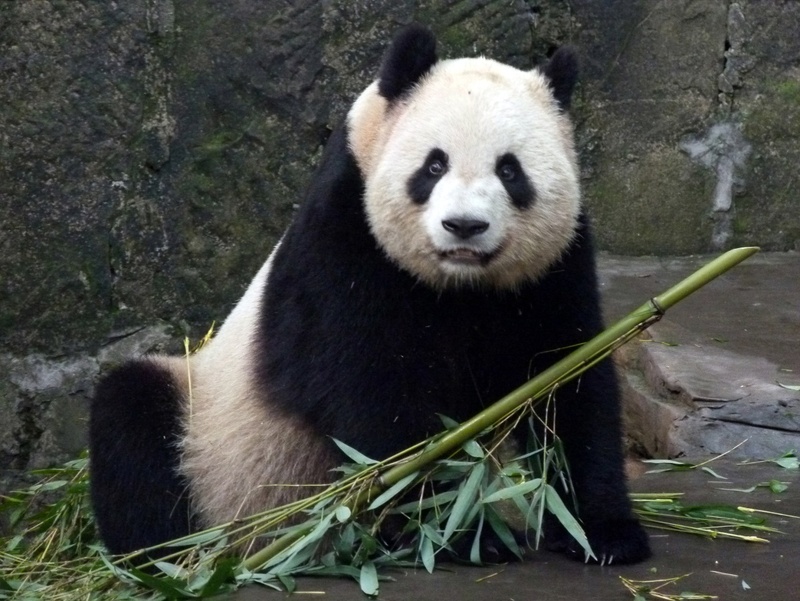 I overheard a man saying to his companion, “They need a panda.” A worthwhile idea, I thought, although I’ve been told that pandas are not affectionate animals. In the panda section of the zoo we visited in Chongqing, the pandas are separated from one another because, apparently, they do not get along. The Garden Tour is beautifully organized. Kiwanis Club volunteers direct parking. Two people at the entrance take tickets, answer general questions. A local 4-H club sells water. Area Master Gardeners, who had come for their own tour the preceding Friday, are on hand to answer questions about plants. Two plein air painters set up their easels in different areas of the garden to paint. And about 900 people came. It’s interesting watching 900 people walk across your land. It stops being where you live. It becomes a public place, a place to walk through, to sit on a bench, to observe critically or approvingly. It belongs to the people who walk there. They become the natural part of the place. It is they, walking down paths, that make the paths exist. The open gates invite them in. They take photographs as if they were on vacation. Someone left a shiny penny on the Buddha. I imagine that person made a wish. A few days later, when I visited a shop at the edge of Corrales, the woman who works there showed me all the coins lined up on a small rim outside the shop’s main window. Inside, a huge statue of Ganesha, remover of obstacles, looked out on the sidewalk. She’d noticed the coins when she’d gone out to place baskets for sale in front of the window. I left one, too. I need some obstacles removed. It is spontaneous, this hope that by giving, we shall receive. Or do we just think no one will listen to our prayers unless we pay for them? I’m not sure about that one. I think we can pray for free. After a man simply walked through the Zen garden (how odd, since the path leads around it), I took a small rake to it, just to obliterate the footsteps. 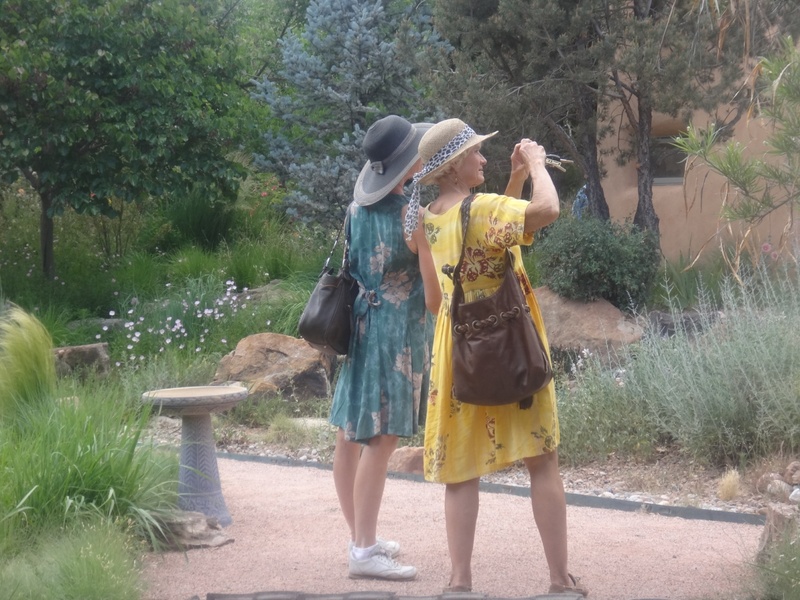 One of the Master Gardeners, not recognizing me, told me later she wondered to herself, “Who comes to a garden tour with a rake?” I liked her idea. What if there was work to do?